Outline:When you convert a movie with Handbrake and find it has Video/Audio out of sync problem, what should you do? Read on this article and get the solution. Actually, Video/Audio out of sync problem is common on many video help forums. People response that after they used Handbrake to rip their Blu-ray/DVD movies on Mac computer, the output movies often appear audio and video out of sync problem. Here, this article will explain to you the reason and show you the solution to solve Handbrake video/audio out of sync problem. Many media players, such as Windows Media Player, VLC and QuickTime, sometimes have a hiccup. Take QuickTime for instance, it may have timescale issues when bringing MPEG source into Avid or Final Cut Pro, which may make audio go out of sync with video. When you encode video with high references, CABAC Entropy coding, 8*8 transform, Pyramidal B-Frames on a slow computer with low configuration, your audio and video will be synced in a wrong way. If many apps are running at the same time on Mac, the intensive use of CPU maybe lead your system go abnormal. So the processes like video encoding, editing or downloading will not go smooth. This is where the audio/video out of sync happens. When you rip Blu-ray/DVD on Mac and are selective in the codecs, you are not suggested to choose DivX and Xvid for them are regularly regarded as the crime culprit of audio/video sync issues. To make output audio match up with video, you can adjust the output framerate to match the source file’s framerate. Open Handbrake on Mac; click "Source" to load the file that has an Audio/Video syncing issue. Click the drop-down menu Framerate to select an appropriate frame rate for your video. Then hit "Preview" button to check whether the syncing problem is fixed. If so, you can go on the encoding process with Handbrake. Or else, try another frame rate till the problem is solved. Some media players support adjust audio timescale on Mac, like VLC. Choose this media player with backward or forward functions to make audio keep pace with video in order to solve audio and video out of sync problem. In fact, there is simple way to solve Handbrake audio/video out of sync problem. Using Pavtube iMedia Converter for Mac will be fix this problem with ease. This app not only can fix Handbrake audio/video desynchrony problem, but also can directly rip and backup Blu-ray/DVD/HD/4K video on Mac. In this app, you can choose any popular codec to avoid audio/video out of sync problem. And in profile settings, you can reset video and audio size, bitrate,etc to get better video quality. 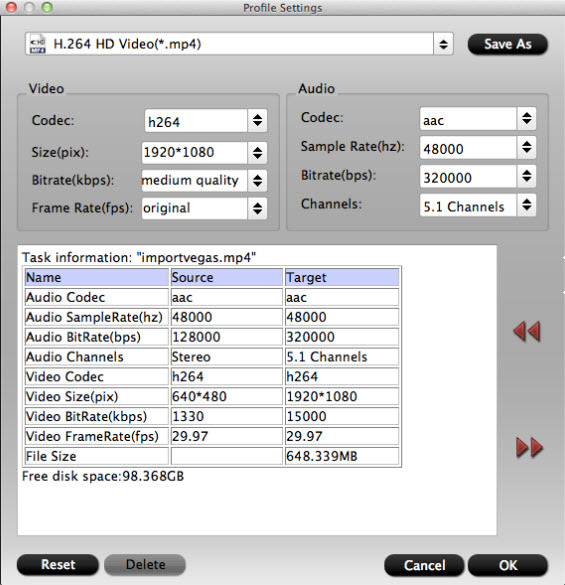 You can preserve 5.1 sound with it when outputting video. If you make full disc coy, it even can keep 7.1 sound. Load the Handbrake file with audio/video out of sync problem from “File” icon. Or you can directly import Blu-ray/DVD movies into it to rip and backup for avoiding audio and video desynchrony problem. In “Format’ bar, select the output video format you want. This app offers you plenty of video/audio formats. This is the most important step to fix or avoid Handbrake audio/video out of sync problem. 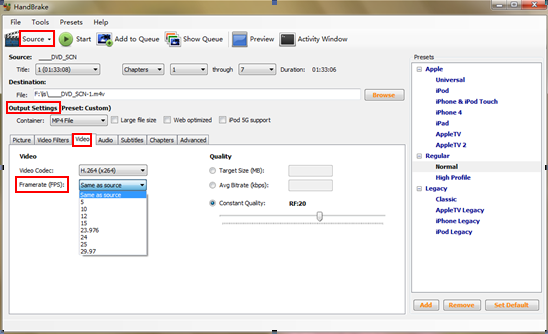 Open “Profile Settings”, you can adjust video framerate, bitate and audio sample rate, bitrate as the source movie. Finally, click “Convert” to start fix Handbrake audio/video out of sync problem. Now, you can enjoy your movie smoothly. With Handbrake Mac Alternative, you can optionally convert the newest Oscars Best Winner movies in 2016 and get a video with syncing audio and video. How to Solve iMovie No Sound Problem When Play, Import, Export a Project?